3D-printed materials are mostly soft and flexible during printing which can cause the printed walls to collapse or fall over. A professor in Applied Mechanics at the Eindhoven University of Technology, Akke Suiker had a Eureka moment and developed a novel solution to this structural problem. He devised a unique model which can be easily used by engineers to find out the printing and dimensions speeds for which the printed wall structures continue to be stable. Suiker’s formulae are so basic that they can become familiar in the rapidly growing field of 3D printing. While traditional concrete deposited in formwork is usually allowed to harden over a length of several weeks, 3D-printed concrete is not. 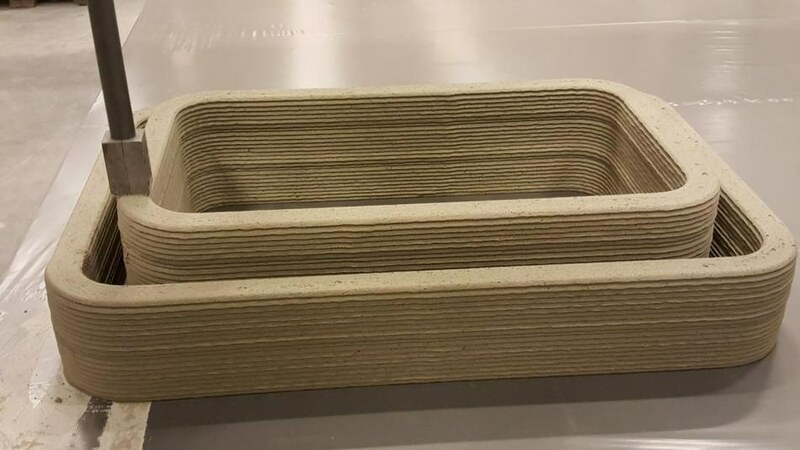 Without supporting formwork, the 3D-printed concrete has to instantly withstand the weight of the ensuing layers of concrete that are printed over it. As the structure gets higher, everybody can feel the tension rising in their body. It is often wondered whether it is already strong and stiff enough to add yet another layer of concrete on top. This is one of the most significant problems in the new field of 3D printing. At first, this problem did not figure in the package of tasks of Professor Akke Suiker, who often saw his university’s large-sized concrete printer being operated on the way to his office. However, one Saturday morning in March, he woke up with a sensational idea on how to overcome the issue and by breakfast time, he was already writing down the first mathematical equations on paper. In the next six months, Suiker was fully occupied by the problem and worked zealously on the details. The results of the study have been reported in the International Journal of Mechanical Sciences1. Suiker used his equations and calculated how rapidly he could lay down the printing layers, considering the wall dimensions and material curing characteristics without the structure collapsing. In addition to this, he can calculate how the structure can be made using as little material as possible and what are the effects of structural irregularities; or what exactly happens when a wall is made slightly thicker or the material curing rate is increased, or if an entirely different material is used, or if the wall is likely to collapse or fall over, or even pulls the connecting structure with it. In the latter situation, the significant damage that occurs distinctly is much greater. Actually, there are roughly 15 to 20 factors that should be taken into consideration but since Suiker has easily scaled his equations, he was eventually left with only five dimensionless parameters. As a result, a highly elegant and insightful model was used to address the problem. When Suiker was queried whether his results will be significant for the field of 3D printing, he is without doubts. "They should be. The insights provided by the model create essential basic knowledge for everyone who prints 3D structures. For structural designers, engineering firms but also, for example, for companies that print thin-walled plastic prostheses of small dimensions, because that is where my equations also apply." The initial interest is already there: Cambridge University has invited him to give a seminar presentation about his work. To validate his model, Suiker used the results of tests performed with the 3D concrete printer at Eindhoven University of Technology, conducted by Rob Wolfs, a PhD student. Wolfs built a computer model simultaneously as Suiker, with which he can also determine the structural behavior during the printing procedure, but on the basis of the finite-element method2. For both researchers, it is indeed great that the results from their separately developed models validate each other. The model developed by Wolfs is different in terms of application. Under specific printing conditions, it works well for an in-depth analysis of complicated problems. However, owing to the requested computing time and purely numerical character, the model is not quite suitable for detecting the most critical effects of the printing process as well as for mapping out the overall trends.